It seems you never have enough plugs for 12V power. In my 4Runner, the stock cigarette lighter worked fine for charging a camcorder battery or powering a portable CB radio, but turn off the ignition and there goes the power. I decided to add a dedicated 12V outlet in the rear cargo area to power my 12V cooler and other items. I found a nice 3 socket power outlet at the local auto parts store and thought that would suit my needs. However, not everything runs off of 12V DC. I have two 120VAC power inverters but as is usually the case I could never find either one before a trip. (Actually the reason I have two is that I used to have one and couldn't find it before a 2 week trip, so I bought another one.) Anyway, Chris Geiger has a nice setup in his '93 4Runner, that seemed to work very well on the Rubicon 1998 trip. So, first thing was to add an auxiliary fuse block for the new circuit. The block I chose has room for 6 blade-type fuses. I don't recall where I got the fuse block from, but likely Radio Shack or a local auto parts store. 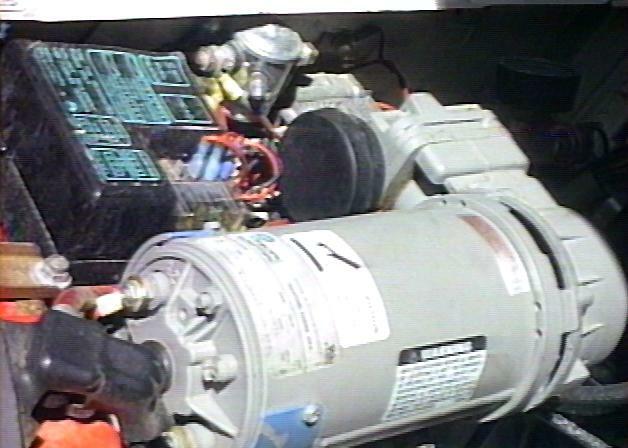 I attached it to the cover of the engine fuse block and tapped the power from inside the main engine fuse box. I fed the wire through the side of the box to a 40 amp circuit breaker then to the new fuse block where I soldered that wire to all 6 of the tabs on one side of the block. As you can see, I already have 3 of the positions used, one for the power outlet, another for my radio and the third of fog lights. I ran a pair of wires back through the firewall and under the carpet to the rear seat compartment and into the body panel. (The circuit is always on, even with the engine off) There are a lot nicer fuse blocks out there, but this one has worked fine for me. I know Blue Sea makes some excellent marine grade fuse blocks, you can check out their web site for details. In back, I attached the power outlet in between the roll bar and the side panel. 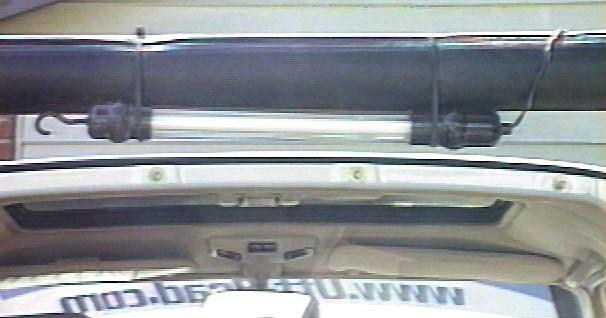 This position offers some protection for the outlet and it is still easy to reach from the rear window or back seat. So, now what to do with all those outlets. Well, I already mentioned the 12V thermo-electric cooler, which works quite well, no messy ice. Another outlet is used for my rear cargo area/trouble light. This is a 12V florescent trouble light from the local auto parts store. It is encased in plastic and consumes 8W when lit (less that 1 A.). 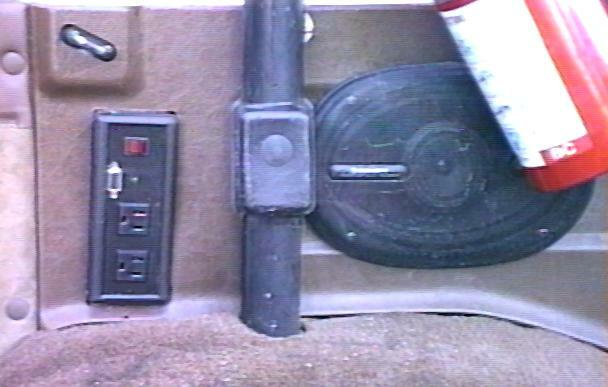 In addition to the 12V lighter plug, I also wired in a 2-prong plug to fit the front trouble light socket on the dash. 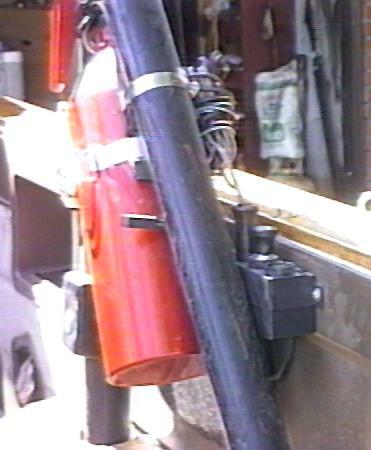 The lamp is attached to the roll bar with two tie wraps. They are tight enough to keep the lamp in position yet loose enough to be able to remove it for its alternate use. To turn on the light, I just reach in and push the plug into the socket. Well, there was still one outlet left, so I took a 300W power inverter and mounted it in the side wall right behind the rear seat. When needed, I can plug it into the outlet for 120V AC power on the road. The unit I have has 2 switched outlets. I riveted a piece of steel bar to the body seam inside the panel and used a large hose clamp to hold the box to that. BTW, you can see one of the Pioneer 6x9" speakers that nicely fit in between the lower tubes of the roll bar.